There is a consensus that the problems of the world exist because of the human race’s inability to manage themselves and their environment. That if human beings were better than their current state, the world would be a better place. It is due to this notion that activism or community involvement came into existence. In South Africa, activism has been the backbone of the democratic regime. Activism refers to the doctrine or practice of vigorous action or campaigning to achieve political or social change goals. Every one of us, in our own way, tries to understand the contextual issues and their causes, based on our experiences of the world. If the perceived reality is not agreeable, the activists then advocate for their individual or collective objectives. The result is a mesh of competing ideas fighting for a platform, making the transformation much more dynamic than meets the eye. With the discussions around transforming Rhodes University getting louder and louder, there are already individuals heavily involved in trying to improve the institution, if not Grahamstown as a whole. It will not be easy, but being informed might assist in making the journey bearable. “Most people have no idea what they are up against when they start trudging the path of activism, what one really has to do to get the work done. There are entire systems designed to restrict developmental initiatives,” said a PSAM colleague who has been working as an activist for more than 30 years. Whether it is policies, finances, permits, services or power, everyone presents their agenda or opinion as the most significant. Activists and civil society organisations, employees, students, stakeholders and communities need to understand that these public structures are not going to automatically change just because they ask nicely. Whether you’re an underground activist, or working within a structured organisation, it is important to be cognisant of a few good practices recommended by various activists. By entering a world of systems and legislature to assert demands they deem as priority, activists become part of a world of inter-disciplinary players who have intensive knowledge of those law and systems, which they exploit as they please. For one to survive in such environments, where lion eats lion, it is important that they inform themselves of the world they want to be part of. It is crucial to know the laws, the systems within systems and the agents that govern those systems. Understanding why the laws exist, in South Africa is a good thing, as they often exist to protect human rights. One veteran activist indicated that it is essential to learn to get behind the official lines, because there are sometimes systems behind systems and people who are in charge behind the curtains. Therefore, it’s necessary for activists to learn to hear what is not said, see what is hidden, and understand the intentions behind propaganda. Learn to ask the right questions, to the right people, at the right time. Learning should not be limited only to systems and legislature; activists should learn to think and act independently. Setting a personal agenda is crucial in maintaining a sense of direction while ensuring that reference frames are aligned with the respective context. Customise strategies according to the issues. There is no ultimate formula to solving social issues, therefore using your discretion is recommended. Create spaces of engagement where conversations of and events aligned with the respective goals can be executed. No matter how ingenious people are, no one can advocate for activism alone. Therefore, identifying like-minded people and building support structures goes a long way in strengthening morale. Learning to process knowledge and transfer skills to make sure the vision continues even when the founders cease to be, is also important. Getting used to reflecting on work, socio-economic, political circumstances, psychological and spiritual well-being, assists one to better understand oneself and one’s kin. This builds confidence and courage to lead, decide on a course and stay true to one’s convictions. It is not enough to reflect or learn: being able to translate what is being learnt into context is crucial. Being patient and honest with oneself, and others, is another quality an activist needs to possess, with an understanding that it is the walls we put up around ourselves that make it difficult for us to understand each other. This in turn forces us to spend a lot of time resolving conflict instead of constructive engagement. Being kind is inseparable from activism. I will tell you a secret: it is seldom your actions or words that people receive, but your feelings. When you feel good, people warm up to you. Being kind not because someone is watching but because it makes both parties feel good is a reason why activists are and need to be kind. Especially since the main aim is to make the world feel better. The ability to give openly and receive is not something encouraged in society, but for an activist is it the breadwinner. Since activists cannot depend on popularity to win votes, they often depend on the laws of the universe. ‘The more one gives, the more one receives’. Mental strength is a valuable asset for an activist as it assists them to sustain their vision. Lastly, if for some reason you read this article and you are convinced that it is speaking to you, this is the final word of advice: Be true to yourself and the universe enough to believe that there is no one else who can do you as you do you. You are the truth you came to this world to tell. 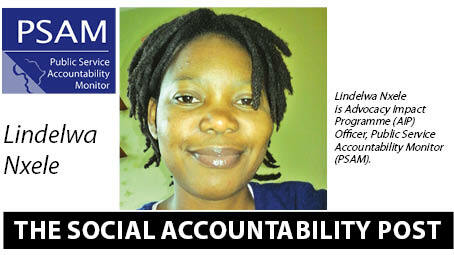 Lindelwa Nxele is Advocacy Impact Programme (AIP) Officer, Public Service Accountability Monitor (PSAM). Grocott's Mail Contributors includes content submitted by members of the public, and public and private institutions and organisations - regular and occasional, expert and citizen, opinion and analysis. The Rhodes University Community Engagement Division has launched Engagement in Action, a new podcast which aims to bring to life some of the many ways in which the University interacts with communities around it. Check it out below.